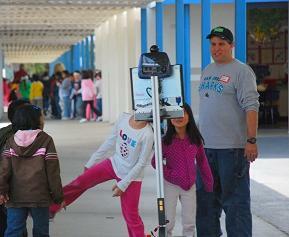 A Willow Garage telepresence robot promoted careers in robotics at a local elementary school. Wouldn’t you have loved to be the kid who brought a real life working robot to school for show and tell? 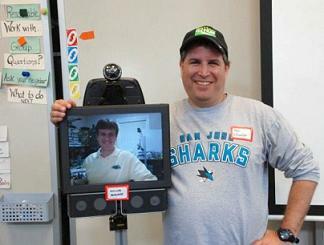 Willow Garage delighted students at a Cupertino, California elementary school for their “Discovery Day” – an opportunity for children to learn about local careers – by sending one of their new telepresence robots (the Texai) to make a presentation. Among the firefighters, doctors, and business executives mingled two WG engineers: Rob Wheeler in person, and Dallas Goecker remotely controlling a Texai from Indiana. Talking with a robot that’s being operated from half a continent away is a pretty cool way to convince kids that open source robotics engineer is the coolest job ever. Check out more pics after the break. Along with making presentations at local schools, Willow Garage has been busy promoting its latest robotic creation. 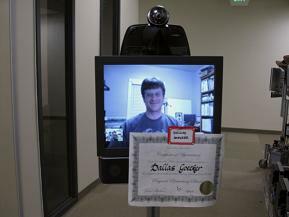 They’ve shared the telepresence machine’s hardware and software specs – which reveals a remarkably short list of components needed to build your own. 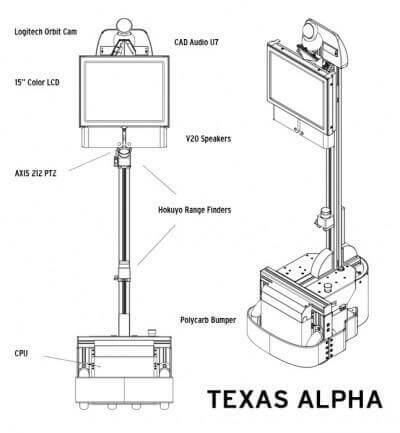 The Texai bot (formerly called a Texas Alpha) uses a base built from WG’s flagship robot, the PR2. Other than that platform, all the Texai’s parts are unmodified off the shelf devices. It also uses ROS software, which is freely available, so I almost get the feeling that a group of students could conceivably assemble one of these telerobots as a school project. Maybe that’s for the next Discovery Day. The Texai (Texas Alpha) telerobot has its specs available at the Willow Garage website for your perusal. As always with Willow Garage, the real story is not just the robot, it’s the approach they have to robotics. While WG doesn’t take the time to tell the public everything about its robots (the associated costs for building a Texai haven’t been revealed for example), the company is one of the biggest proponents of open source robotics. In other words, all the technical details for their hardware and software are freely available for you to peruse, use, and adapt. Ideally, that means engineers all over the world could help create ROS, and develop open source robots together. Call it crowd-sourcing, or distributed production, or Tom Sawyer paints a fence-ism, it’s an interesting paradigm that could be one of the definitive (anti)business models of the 21st century. Who knows, maybe in five or six years the same kids who watched a robot come to their elementary school will join the Willow Garage revolution. Goecker (in the Texai) and Wheeler demoed the telerobot in a crowded school. How's that for a mobility and endurance test? The school even gave the Texai a certificate of appreciation. Humans and machines can appreciate each other!